A few nights ago, the Annual Food Bloggers dinner took place at Michelangelo’s, kindly organised by Ivan of food.recentrunes.com. About 20 food lovers slowly streamed into the elegant atmosphere, most of whom I’ve not yet met before. I was excited to meet like-minded people whom I could talk about food but at the same time a bit nervous, as most of them already knew each other and I was still new to the scene. But my worries proved unfounded as they were an easy bunch to strike up conversations with and very soon I was busy chatting with those around me. 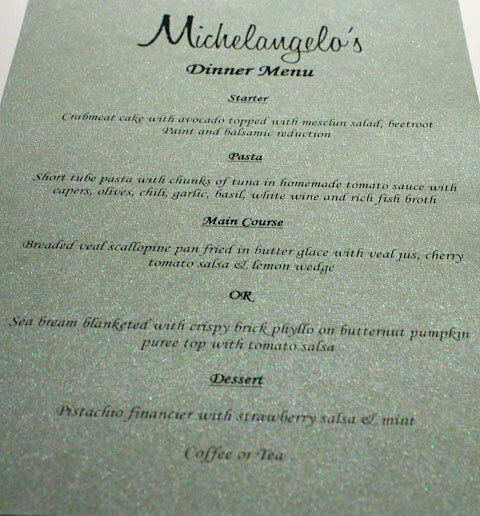 And here was the customised dinner menu for us, prepared by the executive sous chef Dennis Ong. 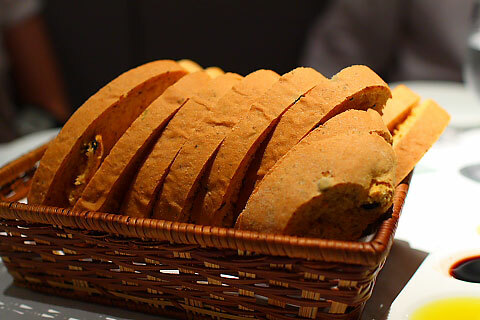 While the conversations flowed around the table, bread service arrived. The slices of bread were crisp on the edges but moist and tender inside, very nice indeed. 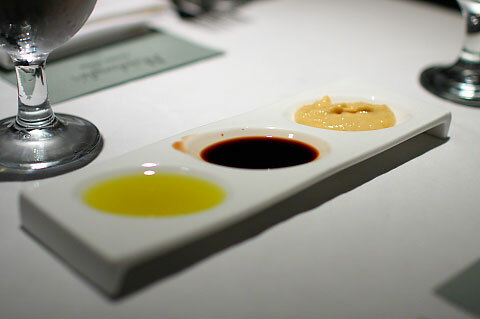 They provided us with a trio of condiments to dip the bread in: olive oil, balsamic vinegar and some sauce that I forgot. 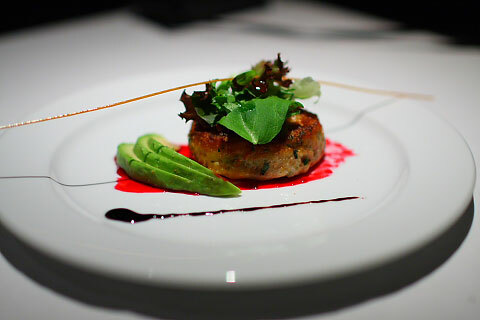 First course was the crabmeat cake. This little chunk of meat was packed chock-full of crabmeat and that added a fresh sweetness to the savoury taste which made this my favourite dish fo the night. Second course had a very long descriptive name on the menu but it was basically penne alla puttanesca con tonno. I felt that this dish had just the right amount of pasta and sauce, as you know sometimes pasta can be too filling. The sauce itself was wonderfully balanced, the olives and capers staying in the background unlike the puttanesca that I make 😦 The seared tuna cubes complemented the sauce well also, with a nice peppery crust to spice things up. There were 2 options for the main course which was veal or fish. The one below is the sea bream which I wish I had chosen but didn’t. 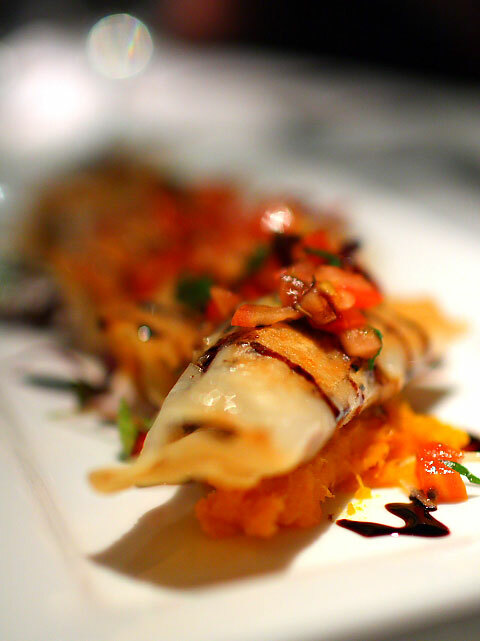 It was about 5-6 pieces of wonderfully grilled/pan-seared strips of sea bream, each wrapped in a thin crispy brick phyllo cracker and supported by the butternut pumpkin puree. 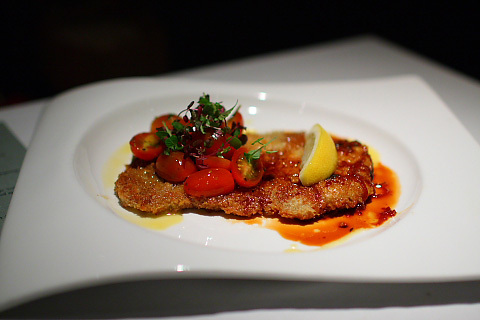 And this was my actual order, breaded veal scallopine. The veal itself was quite nice and tender with the bread crumbs not being too crunchy and hard. But I didn’t like the sauce, presumably the veal jus, because it had this acrid and sour bite to it which spoiled the taste for me. The dessert course was the pistachio financier. My review on this dish is horribly biased as I usually dislike desserts and especially nuts like pistachio. Ironically I didn’t really taste any pistachio because it must have been overwhelmed by a taste I hate even more – Chinese almonds. Most of the people around me didn’t like the dish either because it was a dense sponge cake that was too heavy on the palate for them, since most of them were quite full already. I did finish it totally but I didn’t like it at all. 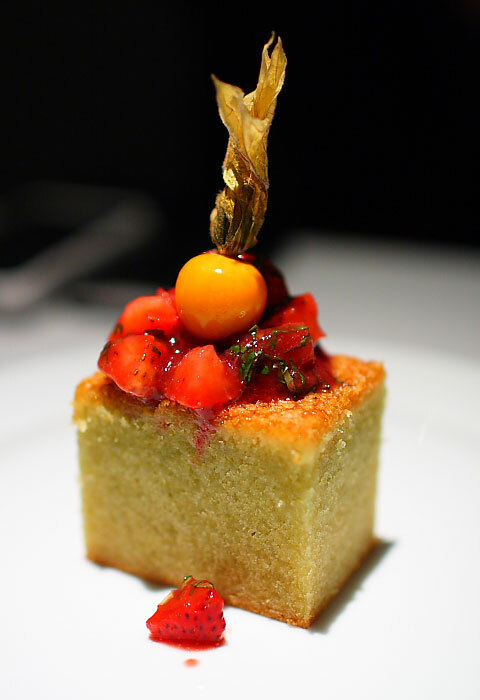 Oh but I did like the cape gooseberry on top! 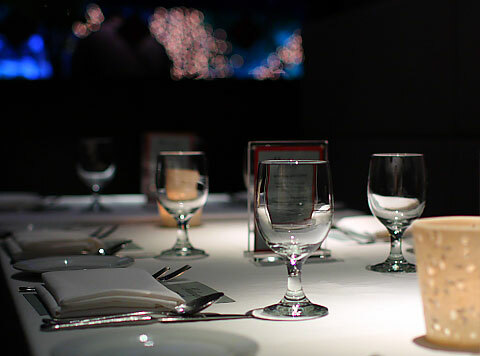 24 Responses to "Annual Food Bloggers Dinner 2010 Redux"
Hahaha yah I wanted to get it out fast! Wonderfully written and excellent photography. It was great to finally put a face to the blog! So fast! Great review and photos. It was an enjoyable dinner, I must say. It was very nice meeting you at last, after all the Twitter exchanges. Now I’m really curious why you use the safety helmet in your display photo! Next time we all go out and makan again lah! Wow, that was a quick post =) Thanks for the updates! Err… What’s with the yellow safety helmet? Heya! U’re so fast!! Haha. Nice post 🙂 I am new to food blogging as well, so brave of you to go meet the experienced bloggers. Thanks! I’m pretty new to food blogging as well but they’re all really nice people, so join in next time! 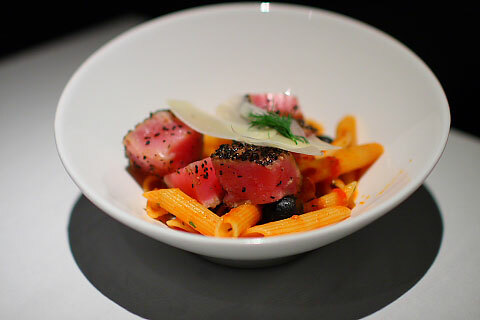 hope u try out the laksa risotto soon … and try my whiskey salmon linguine too! I’m sure we’ll get to meet up more often in the future 😀 And the rotation idea sounds pretty interesting, good way to mix around the group.